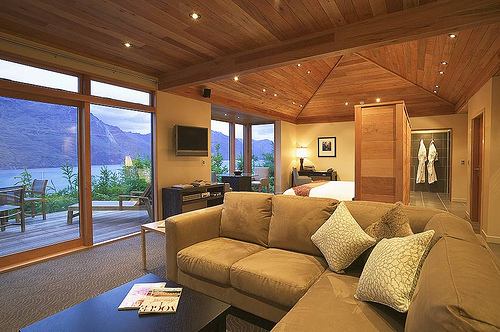 Azur Lodge Queenstown New Zealand is a special hideaway lodge in the South Island – an ideal choice for you’re looking for seclusion. In fact, you’ll see very little of other guests. 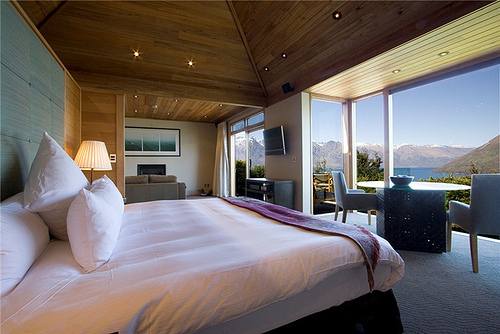 Azur is located on a hilltop with total unobstructed views of mountain views and best of all, the gorgeous Lake Wakatipu. There are 9 freestanding villas at Azur – we stayed at this one for 2 nights – seventy five sqm of space – yay! Azur Lodge is very high tech, which can be daunting for some of us. But there is a full orientation on arrival plus the villa’s guest compendium is practically a book. The snacks provided for each villa are very generous and included the price. But its the views folks – they’re spectacular! Perfect for a honeymoon couple. The villa bathrooms are large and promote total relaxation. Now talking about bathrobes is kinda boring but the ones at Azur do require a special mention. They’re made of the most luxurious silky fabric which drapes the body down to the ankles. After a day on the road to get here, bubbles at the ready, you might find it hard to leave. Its important to know that Azur does NOT have a dinner restaurant. 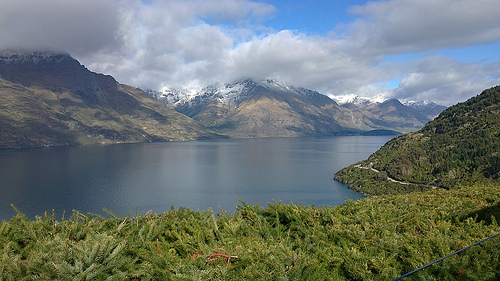 What they offer, is a complimentary drive to a restaurant in central Queenstown. When you’re ready return, you just phone them and withing 5 to 10 minutes, they’ll be there to pick you up. 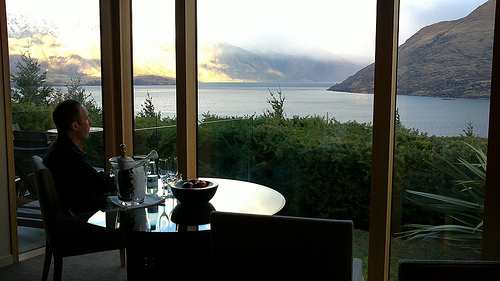 Now, if you don’t feel like going out, you can opt for “in-house Villa Dining” Just consult that marvellous compendium where you’ll find a selection of menus from around 10 different recommended downtown Queenstown restaurants. Make your selection and Azur staff will place the order and deliver the dinner to your villa whenever you like. How cool is that! All food is transferred to Azur’s own gorgeous bone china before being delivered to your villa. The staff will set the table, light the candles and pour the wine. There’s an absence of ‘others’ here. Sure, you know there are other guests staying, but you don’t really get to see them unless you’re passing them on the way to the carpark. No helicopters swooping down to drop off or collect guests and (big-sigh-of-relief) if you like, you can have breakfast delivered to your villa. Azur Lodge is a contemporary style lodge with tasteful minimalist decor. It is understated comfort with discreet staff.